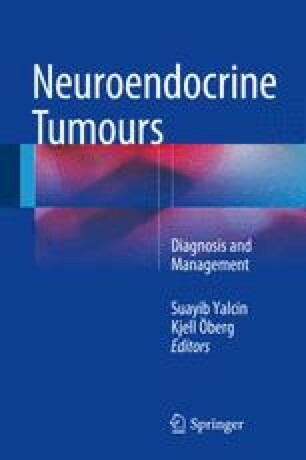 Gastroenteropancreatic neuroendocrine neoplasms (GEP NEN) oversecreting hormones and/or biogenic amines are the causes of specific hormonal syndromes, such as carcinoid syndrome in serotonin-secreting tumors, Zollinger-Ellison syndrome in gastrinoma, hypoglycemic syndrome in insulinoma, Verner-Morrison syndrome (VIPoma), and others. Management of hormonal symptoms, which are often life-threatening, requires interdisciplinary approach and implementation of multiple therapeutic methods. This chapter presents the management guidelines, using surgical and endoscopic methods, and pharmacotherapy, including biotherapy, isotope treatments, chemotherapy, and targeted molecular therapy applied in the symptomatic treatment of GEP-NEN clinical syndromes.